Hurricane Harvey’s second act across southern Texas is turning into an economic catastrophe – with damages likely to stretch into tens of billions of dollars and an unusually large share of victims lacking adequate insurance, according to early estimates. Harvey’s cost could mount to $30 billion when including the impact of relentless flooding on the labor force, power grid, transportation and other elements that support the region’s energy sector, Chuck Watson, a disaster modeler with Enki Research, said in an email Monday. That would place it among the top eight hurricanes to ever strike the U.S.
Less than a third of Harvey’s losses are likely to be insured, Watson said. “A historic event is currently unfolding in Texas,” Aon Plc wrote in an alert to clients. “It will take weeks until the full scope and magnitude of the damage is realized,” and already it’s clear that “an abnormally high portion of economic damage caused by flooding will not be covered,” the insurance broker said. Many forecasters were hesitant over the weekend to make preliminary estimates for how much insurers might pay. Researchers were shifting from examining Harvey’s landfall Friday as a roof-lifting category 4 hurricane to the havoc it later created inland as a tropical storm. Typical insurance policies cover wind but not flooding, which often proves costlier. Blaming one or the other takes time. On Aug. 26 NASA-NOAA’s Suomi NPP satellite captured a visible image of Tropical Storm Harvey over Texas. 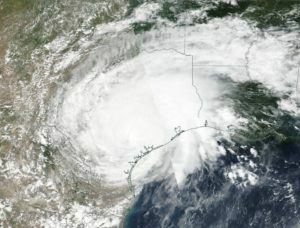 In the Houston area, rainfall already has surpassed that of tropical storm Allison in 2001, which wreaked roughly $12 billion of damage in current dollars. In that case, only about $5 billion was covered by insurance, according to Aon. Those storms are dwarfed by Hurricane Katrina, which struck in 2005 and devastated New Orleans. By some estimates, it inflicted $160 billion in total economic damage. About 47 percent of Katrina losses were covered by the insurance industry, but only about 27 percent is expected to be insured for Harvey, Watson said. Most people with flood insurance buy policies backed by the federal government’s National Flood Insurance Program. As of April, less than one-sixth of homes in Houston’s Harris County had federal coverage, according to Aon. That would leave more than 1 million homes unprotected in the county. Coverage rates are similar in neighboring areas. Many cars also will be totaled. The federal program itself is already struggling with $25 billion of debt. The existing program is set to expire on Sept. 30 and is up for review in Congress, which ends its recess Sept. 5. Policyholder-owned State Farm Mutual Automobile Insurance Co. has the largest share in the market for home coverage in Texas, followed by Allstate Corp., which is publicly traded. William Blair estimated that, in that scenario, Allstate could incur $500 million of pretax catastrophe losses, shaving 89 cents off of earnings per share. Investors began bracing for losses last week. But many didn’t believe that Harvey could wipe out bonds that were issued to protect insurers against storm damage in the region, according to Brett Houghton, a managing principal at Fermat Capital Management. His firm manages more than $5 billion, with allocations to catastrophe bonds. The Swiss Re Cat Bond Price Return Index dropped 0.44 percent in the week ended Aug. 25, the steepest decline since January. The benchmark is recalculated every Friday, so it’s unclear how the debt performed as the storm continued through Sunday. Reinsurers, which provide a backstop for primary carriers, also may get burned. That group include Bermuda-based companies Arch Capital Group Ltd., Axis Capital Holdings Ltd. and RenaissanceRe Holdings Ltd., according to a note last week from Meyer Shields, an analyst at Keefe, Bruyette & Woods. Businesses are probably better covered than individuals. Companies across the retailing, manufacturing, health-care and hospitality industries will be seeking reimbursements from insurers for lost revenue during the storm and subsequent repairs, said Aon’s Jill Dalton, who helps manage claims. But for Texas’s massive energy industry, it’s still too early to project how badly the storm will disrupt supply and distribution. That’s because the devastation keeps spreading.